Getting rid of fat, part 15. My free belly fat book talks about the kinds of food that you should eat and shouldn’t eat. The most important information is to know what the worst food additive in human history is for fat loss and how to avoid it. Hi, this is Dr. Dennis Clark coming to you in my series on belly fat research based on the research that I’ve done in the medical literature to find out how you can get rid of belly fat. This aspect of my report here, I want to tell you about the kind of food that makes you fat faster than any other kind of food that you can put in your mouth. It’s a certain kind of carbohydrate that’s know as fructose or fruit sugar. It’s all over the place. It’s in almost every food. It’s called high fructose corn syrup. I will call that, as far as health and fat goes, I will call that an evil food. There is research to show what happens to the metabolism of fructose as soon as it goes into your body. It is evil. You do not want to have fructose in your diet as an additive in foods like high fructose corn syrup. It’s okay as a fruit sugar because it comes in fruit. There are other kinds of cautions that I’ll give you about eating fruit or eating foods that have the wrong kinds of carbohydrates or the right kinds of carbohydrates for you to get rid of fat. I talk about these things in more detail and you can find out about them in my book, “5 Steps to a Slimmer and Healthier You.” Well, if I seem a little passionate about fructose, there’s good reason for it based on science. It’s really important to know what foods are doing you damage and what foods you really should have. 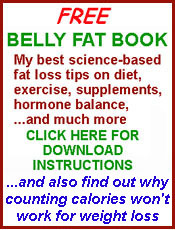 Find out more details about what to eat and what not to eat in my free belly fat book, which you can download now at BellyFatScience.com.